Alternative Terrain Generation more similar to older Versions of Minecraft. 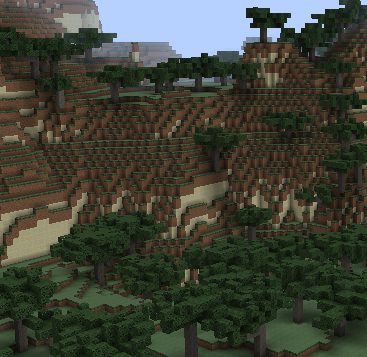 This mod is a variant of the mod VintageCraft Terrain Generator that uses only Vanilla Blocks. - Trees are generated in a very dynamic way, allowing near infinite variations and sizes of the same tree. But the source code is available on https://github.com/tyronx/vintagetg so any modder can update it to 1.10 if they desire so. If this uses only vanilla blocks, why it's needed on client side too if it's installed on server? Because Forge requires mods to be always on Server and Client. If you want it to be a serverside mod only then somebody has to port the code to bukkit or similar. Oh, that would be neat of course. I added the annotation and uploaded v1.1.8, check if it works for you. this way it won't check if the client has the same version or any. But if you would want it to be only server/client side. there is "serverSideOnly = true" or "clientSideOnly = true". This is really cool. Is there any chance of you making a 1.7.10 version? Please do include a change log so we know what is different each time. We should totally suggest curse to add a link to the download details in the Mod OVerview. It's really easy to miss. Do ocean monuments not spawn at all then? No, currently no structures. I just haven't added them yet. Oceans are currently not on the top of my to-do list. Can we get oceans soon? Are there lakes and small masses of water? Thanks for making this though.